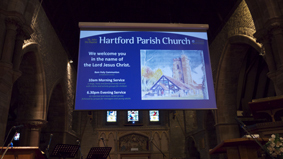 Задача: St John the Baptist Church in Hartford, Cheshire needed to replace its old projector and heavy Perspex screen. It wanted a solution that was visually discreet when not in use and projected brighter, clearer imagery. It also had to adhere to the Church of England’s strict rules for installation. Решение: Ambient Audio Visual selected Optoma’s EW865 projector due to its high resolution (WXGA), high brightness (6,000 lumens), motorised lens shift, its ability to operate 360˚ and its reliability. This was combined with the BX-CTA03 long throw lens. 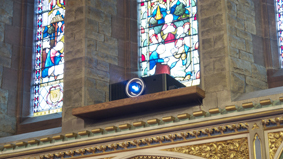 A two-stage motorised rear projection screen was installed which lowers the projector box and then the screen via a remote control. Результаты: The church is delighted with the superb brightness and picture quality of the new projector and how easy it is to operate the motorised screen. The long throw lens and lens shift added real flexibility when siting the projector. 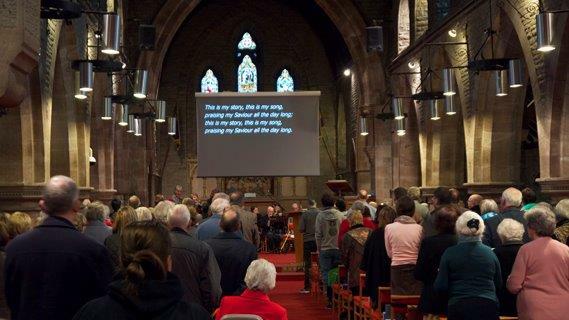 As the projector is able to use rear projection, it was installed well above the musicians and choir and behind the screen, so is completely out of sight during church services.